Liaunig Industrieholding AG targets at a real turnover growth of 5-10 % p.a. 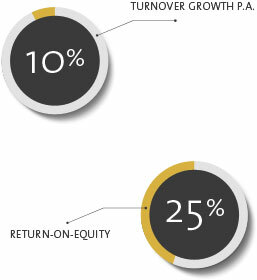 on its investments overall, and a return on equity (RoE) of 25 %. In our associate companies, we aim for asset growth well above the respective sector average. To achieve this goal, we focus on rapid establishment of an above-average equity base while at the same time pursuing an attractive and continuing dividend policy. Each associated company finances itself on a “stand alone” basis through its own earning power and appropriate asset management. Performance-dependent employee profit-sharing models are intended to promote and support the sustainable development of the associated company on a broad basis.